≪Cactus hook≫, characteristic of the genus, with central spines curved like fishhooks. A genus of globose plants becoming elongated, usually solitary (but clustering if the apex has been damaged). Ribs sinuous, spiralled, well defined, with areolar glands; spines more or less sturdy, flexible, elongated, central hooked. Flowers diurnal, sometimes self-fertile, funnel-shaped, silky yellow, orange or yellow with a red throat, fragrant, pollinated by bees. Fruits elongated, spherical or egg-shaped, green or red, fleshy, basally dehiscent. Seeds shiny or matt, reticulate orfoveolate (dotted with holes), black. 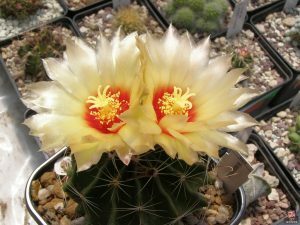 The genus Hamatocactus grows in scattered, never abundant populations, in the Chihuahuan desert, on limestone terraces, in stony areas of dry plains, on foothills, mostly under shrubs (Larrea spp. 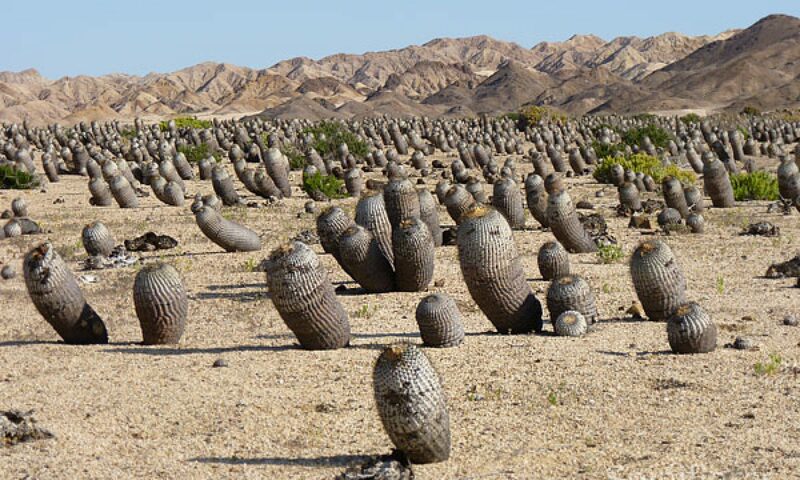 ), in coastal lowlands, from the sea level up to 1550 m in altitude, together with other cacti (Ariocarpus, Mammillaria). Mexico (Chihuahua, Coahuila, Durango, Nuevo Leon, San Luis Potosi, Tamaulipas, Zacatecas), USA (New Mexico, Texas).